It’s graduation season, and I’m whisked back to when Seth, the youngest of my trio of sons, graduated from college. Mixed in with the pride of his accomplishments came the reality that I’d been demoted, again. The title I’d coveted for so many years – through measles and bowl haircuts, Little League and Halloween carnivals — would permanently change. For the third time in my mommyhood career, I’d been reclassified from Mom the Manager to Claire the Consultant. I’d been through this before. First with Shawn, and then four years later with Jake. I knew the routine. Being familiar with the drill, though, didn’t make accepting the bittersweet reassignment any easier. I know my three sons still need me, but not in the ways I’d grown accustomed to. Kids always need their mother (and father), but now I’m on a “need-to-know” basis. And there’s a lot I don’t need to know. As each of my adult children tackles life’s adventures, I now wait in the background wondering if I’ve done all I could to prepare them. But instead of seeing grown men, my heart pictures a five-year-old boy curled on our couch watching Homeward Bound for the umpteenth time and crying inconsolably as Shadow, a golden retriever, falls into an abandoned railyard shaft. Wasn’t it just last week one of them asked asked why chocolate chips are brown? No parent can completely prepare their child for every eventuality – heartbreak, undercooked steak, mean bosses, flu-like symptoms, cold lattes, broken appliances, late paychecks, flat tires. But still we try. I look back on these years and hope my nurturing, guidance and love has equipped these fellas to meet future challenges. Their worlds continue to change and so does mine. And it’s during transitions like this that we grown-ups try to make sense of things. We corral our own goals. Check off items from our Things to Do Before I’m 30 (40, 50, 60, 70) list. Jot down some new ones. My husband Nick and I bought a copy of 1000 Places To See Before You Die. Mostly, we’ve flipped through the destinations, but it won’t be long until we actually have time to visit some. I’m excited to start whittling down my travel to do’s, but my blissful tourist thoughts are repeatedly interrupted by another list formulating in my mind: 1000 Things I Hope I Taught My Sons Before Graduation. This roster is a mishmash of sticky notes, random thoughts and verbal cautions that trail behind as my sons walk out the door. Important things like don’t wash your orange baseball shirt with your underwear; check the date on the milk carton before you make a bowl of cereal; don’t get into a car with an unsafe driver. I’m sure there are more than a thousand things I’ve taught — either by example or lesson — to my sons, Shawn, Jake and Seth. But limited to about 800 words, I’ll share (in no particular order) the top few I hope sunk in. When you can spare a moment, feel free to add the other 990. 1) Trust your instincts. They will lead you on the right path. 2) Common courtesy counts. Please, Thank You, I’m Sorry, Pardon Me are not on the endangered word list, so use them freely. Open doors for women and your elders. Pull the chair out for your lady. Turn off your cell phone in public. 3) Stay grounded. You’ll always have a home and two people who never tire of hearing about your victories, defeats, goals and challenges. 5) Choose quality time over quantity stuff. 6) Little things count. Let that car merge in front of you. Pick up someone else’s trash. Put the seat down. Recycle. Smile. 7) You love your family, but you choose your friends, so choose carefully. 8) Never compromise your health. It’s your most valuable asset. 9) Pray. Pray some more. Mostly, I hope my sons know how much their dad and I love, trust and admire them. Right before our eyes, in what feels like mere moments, they each transformed from a helpless infant to an inquisitive toddler to a typical teen. Now as men they are confident, responsible, capable adults. And if I do say so myself, their folks did quite a terrific job. I will probably never be named Mother of the Year and that’s OK. My award is receiving praise, even for a moment, from any of my three sons. When they were young, I never unearthed a software solution to block spam, a plan to lower the price of gas or even an easy way to remove Orange Blast Gatorade stains from the front of baseball uniforms. I am appreciated by my sons for less notable, but in their eyes, infinitely more important reasons. Over the years, I’ve heard: “Mom, you’re awesome.” (Shawn, when I found his missing soccer cleats.) “Claire, you’re clutch (Jake, after having his sweatshirt mended.) or “Mom, you rock!” (any of them upon discovering a full bag of peanut butter M&Ms in the pantry). The highlight, though was the day, Seth, 11 at the time, declared me the greatest. The title of this essay comes from his reply to my e-mail. Now, you might ask why I was e-mailing my son whose bedroom was less than 100-feet away from my own. But in those techy days, long before texting, e-mail is the easiest way to supply him with information or get his attention. I recall excitedly clicking open this email to learn what wonderful, motherly thing I had done to warrant such a declaration. Was it the fact that Seth’s PE clothes were clean and ready to go every Monday morning? Maybe it was the way I had shredded my Sunday paper into confetti searching for pictures of food items to match his Spanish word list. It could have been an acknowledgement of the miles and miles I had put on my old Villager minivan, not to mention my own chassis, hauling him from basketball, soccer or football practice. But alas, no. None of these routine yet important mom tasks garnered me Seth’s proclamation. It was just a little thing I had done during the course of my daily duties–finding locations of Dairy Queens in San Diego County and e-mailing them to him. An afterthought to me, but huge news to my youngest. After returning from his summer vacation in Sacramento, Seth had told me that he loved to go to DQ, a place his Aunt Sadye took him for ice cream Blizzards, burgers and hot dogs. Wanting to maintain my spot as number one — and not wanting to be outdone by my sister — I invited Seth to lunch one winter afternoon. We ended up at what I thought was the nearest DQ, only to find that the ice cream and burger joint had transformed into a haven for fried chicken lovers. We settled for chicken fingers and fries. Disappointment had painted Seth’s face but he didn’t complain. With his eyes cast down, he slowly dipped his chicken into Ranch dressing and nibbled his fries. I said nothing, but I knew that my son’s happiness was just a Google search away. A few moments at my PC would mean hours of future fast food happiness for the Fadden family. Even though the message was only five words long (two of which were the letters), Seth’s brief e-mail taught me a lot about being a mom. In a flash, it emanated what’s important to Seth. I knew he appreciated the everyday things I did — dinner on the table, allowance on Fridays and clean clothes. But his e-mail signaled another message. What was top priority to me (getting your homework done) was different than his number one (shooting some hoops). Fortunately, there was room for both kinds of important – good study habits and jaunts out for caramel Frappuccinos; washing behind your ears and staying up too late; taking out the over-flowing trash and sock wars. With just a few keystrokes, (20 to be exact) Seth had showed me that somewhere amid the busyness of daily living, mother and son still connect – whether it’s via the Internet, or over milkshakes. During those hectic years of raising kids, so much time is spent on cleaning and grocery shopping, packing lunches and signing permission slips. It’s hard to look beyond the day-to-day tasks for those award-winning Mom moments. These chances don’t come along every day, but they’re there if we look for them – rare opportunities to be nominated as your child’s Mom of the Year (or at least of the Day). My sons are grown. Still, they wave the magic wand of appreciation. I’m overjoyed when I garner another glowing e-mail from Seth, or a compliment from Jake or a thank you from Shawn. It may seem as though I take their praise in stride, but the truth is I’m SFE2E (smiling from ear-to-ear) because I’m OLM (one lucky momma). I was sipping my second cup of creamer-laded coffee when I learned that classic board games were “getting a speed boost.” The article in the business section of the daily paper grabbed my attention. It touted marketers who are reinventing our best-loved pastimes to accommodate busier lives and shorter attention spans. These newly tailored versions of old time favorites will now only take 20 minutes to play. I guess it was just a matter of time before family game night took the express route. I used to live with a group of guys who needed 20 minutes just to decide which game to play. That made it hard to imagine this acceleration. These new versions suggest that I’d concede defeat to any one of my three sons or my husband in about the same amount of time it takes to microwave a meatloaf dinner. Up until now, the only game we played that fast was Perfection and that’s because there’s a 60-second timer built in. It’s not new that families today are moving at the speed of life. I’m referring to jam-packed schedules, not the board game. Even so, when my sons were little (under 5 years old), my husband, Nick and I made time to sit crossed legged on the family room floor and try our luck at Candy Land (Chutes and Ladders, Memory, Hi-Ho Cherri-o! or whatever game caught their interest that week). This usually meant that we’d end up on the losing side of these encounters, often on purpose. I learned early on that if I won, it automatically signaled that I’d be challenged to another game, where I was guaranteed to come in last. A single game could easily evolve into the best of seven series for Candy Land supremacy and household bragging rights. A typical scenario went something like this: After a preschool-age Shawn (or Jake or Seth) “randomly” shuffled the cards and placed them on the board, Shawn (or Jake or Seth) would pull the Queen Frostine card and be transported mere spaces away from certain victory. This was a long-standing family mystery that could only be matched by my uncanny ability to pick the Plumpy card and be banished to the space marked with a plum at the start of Candy Land game board. Defeat was certain. Their eyes held a twinkle of glee at their imminent triumph as I hammed-up my disappointment at being sent back to the beginning. My next strategy was to engage the guys in games where I thought I had an edge. However, I didn’t have much success mustering up enthusiasm for a rousing game of hopscotch. Everyone claimed to be too busy or too tired to be lured into a heated round of jacks and I swear someone–probably Nick–hid my Mystery Date game. I guess they didn’t like those odds. But just mention Cranium, Scattergories or the sports version of Scene It? and all of a sudden holes in their schedules magically open up. As they got older, my sons’ interest in playing games with our family stayed constant. Those lazy afternoons filled with Monopoly, Double Trouble or Clue transformed into Catch Phrase, Balderdash or Spoons. The game selection has changed and there might not be an actual board involved anymore, but we still play. Our game nights expanded to include spouses and a larger circle of friends. We love sharing the laughter, the joys of competition and just being together. No one is concerned about how long it takes. This is why I’m not convinced that faster is better. There’s still a place for the luxury of the steady, slow pace of playing games. These new twists on the classics that rev up the time it takes to finish may be fixing something that isn’t really broken. There’s always tomorrow. If bedtime shows up before our game of Monopoly is done, we just move it — board and all — to the top of our seldom-used dining room table. Tonight, if I’m lucky, the TV, the computer and the video game system will get turned off. My family will stop by and debate who wants to be the racecar, the dog, the iron, the top hat, the boot or the wheelbarrow. Me, I’m always the thimble. Choosing our playing pieces for Monopoly; now that’s something we can finish in 20 minutes or less. This week, I’m planning to dye my fingers a new shade of purple, a color not found in any box of crayons. It falls somewhere between eggplant and magenta, and pretty much clashes with my Easter outfit. Hopefully the stain will fade before I go to a concert with my neighbors next week. Guess I can always wear gloves. All of this in the name of coloring Easter eggs with my family . These days, though, it’s tough gathering the egg-colorers. There was a time when I would be surrounded by a quartet of boys happily decorating oval orbs in a rainbow of hues. Once the decorators left, I’d stand alone near a plastic bowl holding four dozen hard-boiled eggs, surveying the damage once known as the surface of my kitchen table. I had thought I’d learned my lesson from last year’s Easter egg coloring fiasco. That’s why I had painstakingly blanketed the table with layers of yesterday’s newspaper, but somehow a pinkish-green dye managed to find the one triangle that went unprotected. The oak grain now possessing a colorful, confetti-like stain. This botched job was not a commentary on my table-covering abilities; it’s directly related to the five people vying for space around six coloring cups. 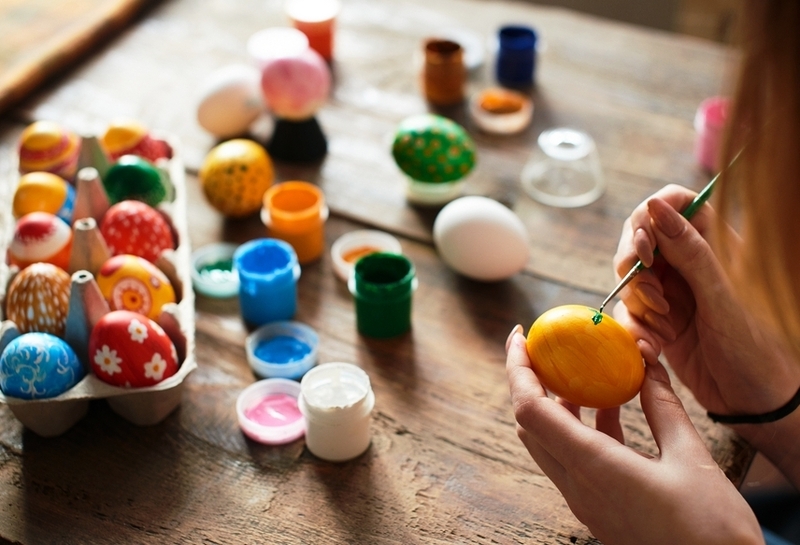 Mess or not, the Coloring of the Easter Eggs has been a key element in our family’s springtime traditions that include new clothes, egg hunts and baskets full of chocolate bunnies. Mess or not, the Coloring of the Easter Eggs has been a key element in our family’s springtime traditions that include new clothes, egg hunts and baskets full of chocolate bunnies. It’s these customs that I count on year after year to replenish my little-girl-at-heart spirit and keep me on track as mother, and now a grandmother. As a child, Easter meant a frilly bonnet, new patent leather shoes and the promise of a basket to be filled and hidden by the Bunny. My family has their own ideas about how to welcome Spring. Years ago, I would watch my sons, Shawn, Jake and Seth, balance hard-boiled eggs on the rim of a flimsy wire holder only to plop them with great care into the pools of color. Each allocated 12, while my husband, Nick, and I share a dozen. Often this process yielded a cracked egg or two. What a sight to behold: the five of us huddled around the kitchen table without a pepperoni pizza in the middle. For this group to sit in the same place at the same time, the enticement had to be huge. Normally my team of three sons/one husband was off doing their own thing: soccer practice, mowing the lawn, playing video games, away at college. But for theoe few minutes, we gathered as a family with a common goal – to create the best, most bizarre-colored Easter egg. With my crew, best isn’t defined like it might be by the judges who award Nobel Prizes or Oscars. You won’t find these guys producing a Faberge egg look-a-like. Best usually ended up being the funniest, stupidest or oddest egg. I always wondered that if I had daughters instead of sons, the winning egg might have a more artistic tilt. Maybe in a few years, when my granddaughter Windley is old enough to participate, I’ll find out for sure. Alas, as a boys-only mother, I’ve learned to look at things from a different viewpoint. I stayed competitive by marking my eggs with corny sayings or kooky nicknames, but I never won. This contest was fixed. The brothers voted for each other’s entries and I ended up looking for a recipe that calls for 48 hardboiled eggs, give or take a cracked few. Teasing, pestering and bestowing nicknames on their loved ones is one way the male species shows they care. Nick was renamed Scoop, after the boys found out he worked scooping ice cream as a teenager. I was pegged Pebbles a la the Flintstones’ daughter, because of the ponytail I pull to the top of my head when I do my morning workout. During the two years he wore braces, Seth was called Sid (after the mean brace-faced kid in Toy Story). All these names and more would float to the top during this creative free-for-all, only to find themselves written on eggshell surfaces with a wax pencil the size of a golf tee. I didn’t ponder the absurdity of it all, because if I did, I’d be tempted to trade the bags of jellybeans in for green bean seeds and spend the time planting in my garden. Why dye dozens of eggs, put cellophane grass in the bottom of a long- handled basket or buy yellow marshmallow-shaped peeps? Because those things, along with a new dress to wear to church, singing Here Comes Peter Cottontail and tulips decorating the center of my dinner table make my Easter. This year, blessedly, our family has grown. After inventorying the selection of pastel eggs nestled in our refrigerator, the Bunny will place one in each of the eight baskets ready to be hidden. On Easter Sunday morning, it will be easy for me to find mine. I’ll look for an egg that says “Pebbles Rocks” scrawled unevenly across a purplish tint. That’s when I know, ridiculous or not, these are the moments that mean the most. Maybe not to my kids, but definitely to a bonnet-wearing little girl who years later became a mother and a Sitie. It’s January 2. My husband, Nick, is standing in our driveway, taking down the last string of lights woven through our bushes. He’s carefully wrapping them around a cardboard holder, one strand at a time. His goal is to prevent the lights from being tangled when he gets them out next winter. Fat chance. Me, I’m inside the garage, packing up the last of the stockings, ornaments and candles and squeezing them into one of the eight boxes of Christmas decorations we’ve accumulated over the years. Nick’s secretly hoping that I haven’t added any boxes to the tally this year. Of course I have and I’m hoping he won’t notice. I’m also hoping that come December 2016, I will remember where I put the Christmas cards I just bought. My bargain cards, purchased at a 75 percent discount, will save me a ton — if only I remember that they’re in box six of eight. I make a mental note to write that down somewhere. I never do. That’s part of my problem with saving money. I need to be more organized. I fare about as well as most in keeping track of things. I make lists, buy in bulk, read the sale ads. I come from a long line of super savers. I’m used to counting pennies. My mother, Florence, instilled her thrift gene in me, along with her favorite mantra: Save, save, save. So I recycle bubble wrap, wash out plastic zipper bags and I buy next year’s cards at Target’s after-of-the-holiday sale. It’s a good thing, as long as I remember where I put them when the next Christmas season rolls around. Even though I no longer have to scrimp for extra dollars to add to three college funds (blessedly our sons Shawn, Jake and Seth are graduated), I still shop smart. Heck, a gallon of gas tops what I made per hour as a 17-year-old part-time shoe clerk, and recently I saw a grocery store sign offering easy financing for a dozen eggs. That’s why I relish the start of a new year. January gives me a clean slate, a fresh beginning, a chance to improve on a few things like: spending more time with my family, losing weight, reading more, praying more and saving money. Over the years, I’ve had mixed results with two of the five: losing weight and increasing quality family time. I’ve done better with deepening my faith and my reading output has increased. But it’s that being thrifty resolution that eludes my efforts every year, because it’s hard to tell whether I’m really saving or not. For example, at a recent potluck brunch with four of my girlfriends, I bought a 12-pack of giant muffins at a warehouse store. At less than 50 cents each, I thought I’d found a deal. But did I? After the brunch, there were seven muffins left over. None of my friends (also struggling with weight-loss resolutions) wanted to take them home. My sons — more the donut-eating type – weren’t interested either, so my bargain muffins sat untouched in the refrigerator, until I finally tossed them out. Still I soldier on, proudly toting my coupon caddy along with my grocery list, seeking low prices, bargains and discounts. As the family budget-balancer, I can’t give up. Clipping coupons, mailing rebates and pursuing two-for-one sales are just part of my strategy to be frugal. That’s how I keep potato chips in the pantry, ice cream in the freezer and toothpaste in the medicine cabinet. Me, I’ll be back inside the garage surrounded by eight or ten brown cartons, having a conversation with myself. Now what box did I put those cards in? Did I even buy Christmas cards last year? Maybe there should be an addition to my 2016 New Year’s resolutions – improve memory. Hope I remember to write that down somewhere. Forrest Gump compared life to a box of chocolates. I’m a chocolate lover (especially when it’s covering nougat), but I disagree. I think life is more like a box of jigsaw puzzle pieces—1,000 lopsided segments, odd-shaped bits and unfamiliar parts. Some pieces are smooth and easy to recognize; others are downright jagged and unwieldy. You know it’s going to take awhile to figure out which side is up. Like many moments in life, puzzles start out a jumbled mess, but with consistent effort, piece-by-piece, it all comes together. Fun, frustration and unexpected surprises intertwine as the fuzzy picture comes into focus. I’ve been a jigsaw puzzle aficionado since I was a teen. You’ll find one–in various stages of completion–atop my dining room table. I keep it corralled on a sheet of foam core board for easy relocation to a coffee table when it’s time to eat. Visitors–family and friends—are familiar with my loosely enforced 10-piece minimum. Before kicking up their feet, getting a snack out of the fridge or changing the TV channel, they’re invited to make a puzzle contribution. After all, we’re in this together. My three sons grew up with jigsaw puzzles in their midst, but only two share my puzzle passion. The oldest, Shawn, displays remarkable patience as he methodically matches pieces to the correct opening. He likes to work in quadrants. Youngest brother Seth declares his preference to work in silence, not appreciative of the ongoing banter between Shawn and me during the puzzle-resolving process. Middle son, Jake, doesn’t work at all. He’s a puzzle-giver, opting to gift them rather than complete them. Thanks to Jake, hours have been spent reconstructing movie posters, scenes from TV sitcoms, carousel horses and, my favorite, the impossible sea of dice. All were challenging, but not as dangerous as the puzzle my friend, Robin loaned me—a plate of Oreos. Ten days, three empty cookie bags and two pound later, it was complete. When I returned it, traces of black cookie crumbs that had fallen from the corners of my mouth were mixed in with the pieces. Our family comes from a strong line of mystery solvers and puzzle-doers. When my sons were little, their grandfather, Tom helped them complete their 100-piece pre-school puzzles, insisting they put the frame together first. An engineer by trade, Pop never consulted a dictionary as he solved newspaper crosswords in ink–a feat I’ve never attempted. 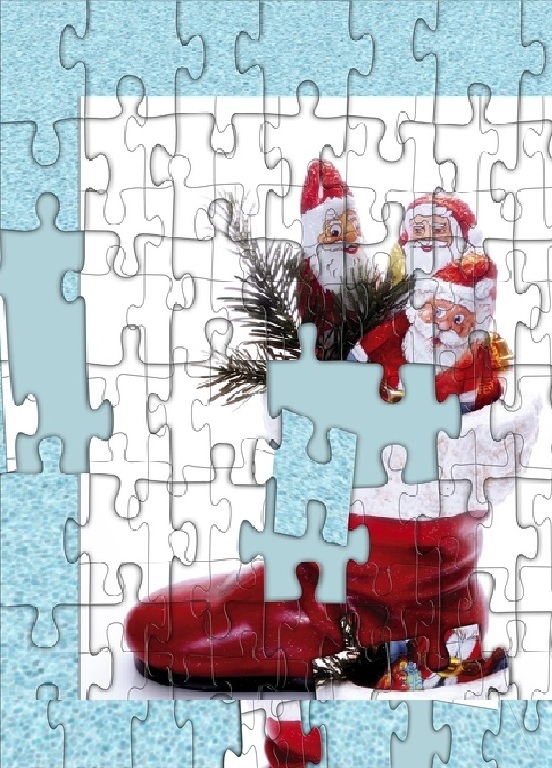 We still follow Pop’s frame-first jigsaw puzzle tradition. I think he’d forgive us the occasional slip when eager hands finish a section before all the edge pieces have been ferreted out. Not only are jigsaw puzzles a spontaneous, ongoing way to spend snippets of quality time together, they can aid in untangling some of life’s quandaries: Why does the Internet disconnect when the house phone rings? How can I camouflage the leftover meatloaf? What’s that weird hissing sound in my bathroom? Often, answers don’t come easily. Instead of racking my brain, I work puzzles. In the quiet early morning, under the bright illumination from my skylight, my brain clears while I make sense out of a jumble of pieces. Previously unrelated colors and shapes slowly form a cohesive picture. Remarkably, other life concerns find their solutions as I search for edge pieces or one that resembles a shamrock. Sprinkled among this season’s holiday cookie baking, present wrapping and tree trimmings, will be Christmas-themed jigsaw puzzle-solving. I can’t wait to open the classics we work each year like the Norman Rockwell holiday montage or Charlie Brown’s Christmas tree. With holiday busyness surrounding me, puzzles are a delightful break from the frenzied action. They’re my pause in the midst of competing deadlines. I’ve learned my lesson, though. This December, when I’m shopping for a new puzzle to add to the collection, I’ll bypass the lids picturing gingerbread men, candy canes and chocolates. I’m sticking with peaceful, joyous, festive images–snowmen, carolers and angels–whose charms won’t compromise my waistline. It’s taken me awhile to accept this reality. I’ve always had my suspicions though, starting when I was 6 and my brand new Slinky got a kink in it. But now I have verifiable proof. This morning as I washed my face with anti-aging cleanser, I discovered fresh wrinkles framing the sides of my smile like brackets. No surprises there. What I find really unjust is that right below these newborn laugh lines, nature gifted me with a zit. Guess the joke’s on me since I mistakenly believe that once you become old enough to earn wrinkles, your face should be a pimple-free zone. One or the other, I say, but not both. 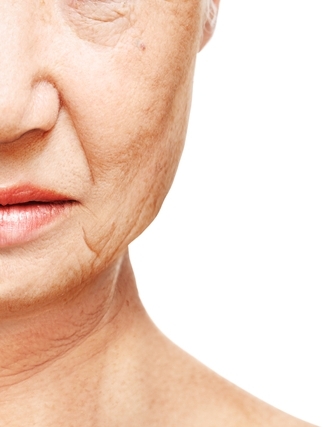 Acne and crow’s feet shouldn’t live in perfect harmony. Clothing designers are messing with me too. Earlier this month I scoured the stores looking for a bargain party dress. The clearance racks are full of 4s and 6s and 8s. Where are the 10s, the 12s, the 14s? Haven’t the garment manufacturers figured out there are more of us wearing double digits than gals who can enumerate their clothing size barely using the fingers of both hands. Calories don’t play fair either. Even when I try to eat healthier, I don’t. In my ongoing quest to get skinny, I grabbed a bag of trail mix instead of nibbling on some sugar cookies. The next day I bragged about my improved eating choice to my perfectly fit friend Joni. She laughed. “You’d be better off just eating a handful of M&Ms.” I didn’t want to believe her, but when I got home I checked the nutrition facts on the trail mix bag. Joni was right. Excuse me if I sound like a sorehead, but who wants to live in a world where a cup of raisins has seven times as many calories as a bunch of grapes? Who decided that 4 ounces of tofu is only 88 calories while a 2-ounce Snickers bar weighs in at 271? And one more gripe: Why do things break in bunches? In the past 10 days, my computer monitor died, the coffee pot gave up the ghost, my car battery decided it didn’t need to perform any longer and the icemaker in our barely two-year-old refrigerator developed a constant drip. The topper was two days ago when my husband, Nick, walked into the kitchen and — with his teeth chattering — asked who turned off the hot water. Alas, our 10-year-old water heater with a nine-year warranty had delivered its last gallon of hot water the night before. Normally, I’m a glass-is-half-full-kind-of-girl. I grew up hearing my Mom sing along as Bing Crosby belted out “Blue Skies.” When my toast lands butter-side down, I brush it off, grateful to have something to eat. Recently though, I find myself tallying up life’s many inconveniences instead reveling in its abundant Godsends. It’s a good thing that Thanksgiving and Christmas are just around the corner, because tucked in alongside the hectic hustle and bustle of the season is an annual reminder to pay attention to life’s important moments. The holidays gently inspire me to stop being the gal standing in line at the complaint department and spend my time breathing in the sweet, refreshing air of gratitude. I can quickly list my grumbles in a less-than-800-word essay. Thankfully, recounting my life’s blessings would take pages and pages of effort. Where do I start? A wonderful childhood. My loving husband. Our healthy, happy sons and daughters. The anticipation of welcoming a grandchild in the new year. My sisters and brothers who love me in spite of my quirky habits. Long-time friends who — under no genetic obligation – continue to make time for me. There are many simple yet sustaining delights — cozy fires, a warm cup of tea, coconut cake, the memory of my mom’s voice. My vow is to keep the holiday spirit alive in the coming months and pay better attention to the ever-expanding list of these priceless treasures. No doubt I’ll backslide a time or two — especially around April or July — when the washing machine develops a grinding noise, my Camry gets a flat and a newly sprouted blemish finds companionship near a brand new laugh line.